I am not much of a meat and potatoes person but have grown more and more fond of good seafood dishes. Here's a tasty and healthier alternative that many of you carnivores can sink your teeth into. This dish was partially inspired by an experience formed in Brazil a few years back. I was very fortunate to have been able literally uproot, meaning dig out , fresh yucca roots, clean them and cook them, and then consume it , all with the a matter of a few hours. Once you have food that fresh, you will never walk through grocery isles the same way. The fan club was surprised how land and sea could come together so nicely in this dish. Prepare the yucca chunks by steaming large pieces of yucca in a covered pot with about 1-2 inches of salted water (covering the yucca half way) with a garlic clove. Cook until tender , remove from heat, drain water. Split the yucca cylinders in half to form a side that is flat. Set aside. Saute the frozen baby peas , shallots in EVOO , Season appropriate. Do not over cook. Flash brown the Yucca pieces in a skillet with some flavored butter. Repeat on all sides.When plated, sprinkle with a pinch of salt. 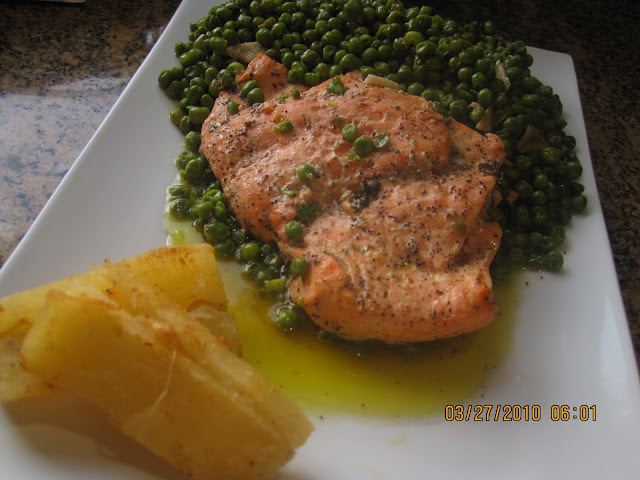 Braise the Salmon steaks by cooking in a bit of EVOO, topped with some salt and pepper. Best results if you cook over medium heat using a covered pan so that the fish remains very moist. Try yucca some day. It will surprise you too my friend.